Bought as a gift, looks like good quality. Came in plastic, instead of a regular bag, with the zipper that I'm use to singing. 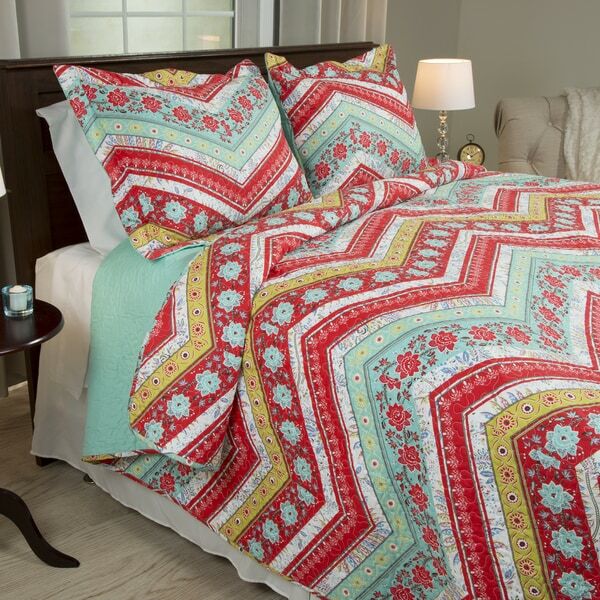 Reinvent your room with the Xena Quilt Set by Windsor home. Add flare to any bedroom with bright colors and bold patterns. We absolutely LOVE our new quilts. The colors are so pretty and the quilt is very soft. My daughters 6 and 9 love their quilts. They added the perfect tween look to their room. Definitely would buy this again and recommend to others! We love! It's oversized and dies a better job covering my extra deep mattress. Love the bright colors in this quilt. This quilt is thin and scratchy. it’s also not big enough to cover my king mattress even though its a king sized quilt. Love the red, aqua and yellow! Soft to touch and didn’t cost a bunch. Buy one to get your ZEN on. Loved the pattern and style. You can do so much with it for SO few bucks! A bargain! This product is very heavy too. Very nice weight. I was impressed when it came in the mail. The package was large for a twin. Yet another wonderful quilt found on overstock. The vast array of quilts are fun to shop for and even more fun to put in a guest room that people love to stay in. Bought this set for the bed in our fifth wheel, the colors are vibrant even after washing and it makes me smile every time I see it! This is a very thin quilt I would not use it in the winter months. I would never pay full price for it. Love the colors. Well constructed. I ordered 2 of them. One for me and one for my daughter. Just right for summer. Lite weight and washes beautifully without fading. Great Value. "what is the percentage of cotton vs polyester? Is the outside cotton with polyester batting?" The filling is 50-percent cotton and 50-percent polyester. The cover is 100-percent polyester. "is the color more like burnt orange or dark pink?" It's red. There's light pink in the quilt but it's not easily seen. "Is this quilt teal and red?" Hello AR, we try to represent the colors of our products accurately. Unfortunately, due to the difference in monitor colors we cannot guarantee that the color will match exactly what you see on your screen. Thank you for shopping with us. I would call it more of a mint green but when I hold up teal things with it, it matches very well. I love it.